I love business cards. I collect them. I have cards from pre-zip code days. Some of my old business cards have my area code as 201 then 908 and finally 732. Many cards come to me from past and present students. Some start with a photo of the agent with dark, wavy, then distinguished gray broker candidates and some finish off as balding instructor candidates. Some cards have a glossy finish that can blind. Others have a matte finish you can sand a boat hull with. The backs are also being customized. I know an agent who has a calendar on the back. Okay it’s from 2008 but still an entire year located on a few inches is amazing. The months are so small they are only readable under a microscope but this is still very cool. I have seen some with a tip calculator. I personally would never use one of these. Think about it. If you gave a lousy tip would you still give the waitress your business card?. I think not. If I were ever to give a lousy tip I would leave some other agent’s card behind. Oops! Some agents use tent cards. These Three-D monsters hold too much information. They are like disposable passports. They can contain chapters of everything you have done since fourth grade, pictures of family members, market evaluation coupon, fifty ways you can be contacted and lastly “I love referrals” on the back. I have cards that have designation initials after the agent’s name. Some agents have so many initials they need a card for the card to explain the initials. Some initials I recognize others, sorry to say, I am clueless. Some abbreviations sound like learning disabilities. Some initials make me bow at meetings. They are all very confusing. Does the public know what the initials mean? I sure hope so for the agent’s sake. What I can’t get over is what is missing from cards. 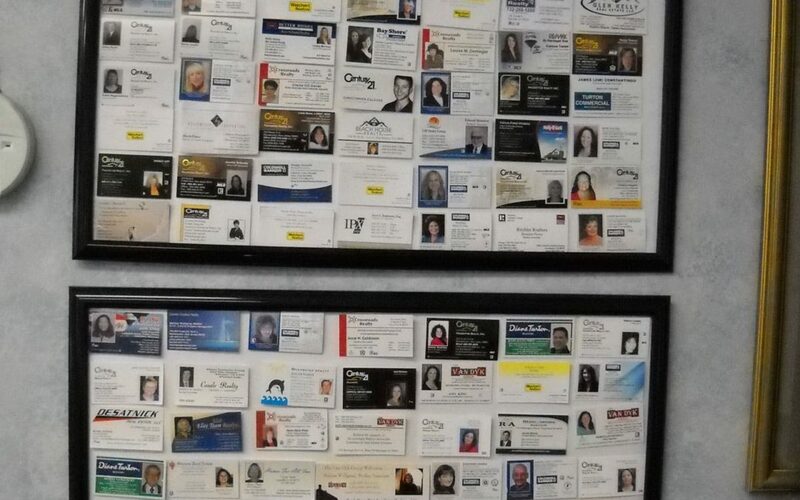 Many agents are college grads. No, not some rinky-dink school but BA’s, Masters Degrees from some big name school. I met an agent who has a master’s degree in marketing and has SRES on her card only. I met a retired army colonel who has CDPE only on his card. I’ll never forget women who spoke Spanish, Italian, Portuguese and French who had nothing about that on her card. These degrees, skills and accomplishments give you credibility. Flaunt them. Business cards are your second impression. Check them out. Make sure they comply with a Real Estate Commission Rules and Regulations, but give them a WOW FACTOR. If you know a second language, tell everyone. Ex-Military, we are thankful for your service and would love to give you business. College grads, proudly display your degrees and make your Mom proud. By the way do you tip 20% with or without tax?